LG was one of the first companies to demonstrate a Moorestown based phone as recently as earlier this year. Just 54 minutes ago however LG announced that starting in Q4 2010 it will be shipping smartphones based on NVIDIA's Tegra 2. We first introduced you to Tegra 2 back at CES 2010. It's NVIDIA's second generation smartphone SoC with a pair of ARM Cortex A9 cores (ARM's first out-of-order architecture). The dual core CPU will run at 1GHz. 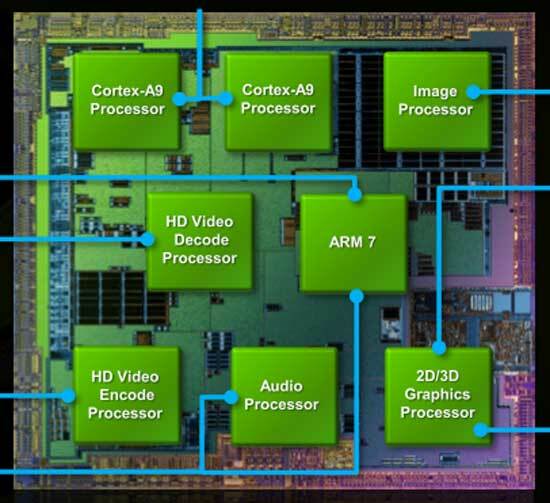 Tegra 2 also features NVIDIA's own mobile GPU, although we know nothing of its architecture or how well it stacks up to high end GPUs from Imagination Technologies. NVIDIA calls it a GeForce GPU however I'd be surprised if there's any similarities between it and what's shipping in desktop GeForce GPUs today. LG's press release is pretty light on details although we do get some performance projections. LG states that web browsing can be up to 2x faster and gaming performance can be up to 5x faster compared to single core processors running at 1GHz. If we're conservative and assume that is in comparison to Qualcomm's Snapdragon SoC then we'd expect Quake 3 frame rates at just under 100 fps. Web browsing at 2x the speed of Snapdragon would be much faster than anything we've seen to date. LG mentions that Tegra 2 will enable 1080p HD video playback however with no indication of bitrate it's too early to get excited about that claim. TI's OMAP 4 will also have 1080p support when it ships in phones next year. The same is true for Intel's Moorestown based devices. Obviously SoC speed isn't all that matters, LG has to deliver a compelling smartphone design. The first LG Tegra 2 smartphones will be a part of its Optimus Series of smartphones, most likely running Android. SEOUL, Sept. 7, 2010 – LG Electronics (LG) announced today that it will introduce a series of fast, powerful smartphones starting in the fourth quarter of 2010 utilizing the second generation NVIDIA® TegraTM mobile processor, Tegra 2. Tegra 2 includes the world’s first dual-core CPU, which powers through complex tasks to achieve significant leaps in performance. LG will integrate Tegra 2 into its smartphones, providing them with unprecedented power, speed and graphics capability. These smartphones will be part of LG’s Optimus Series, a new line of innovative mobile products. LG selected NVIDIA Tegra because it enables a new mobile experience and content capabilities. Tegra 2 features a number of mobile “firsts”: the first mobile dual-core CPU, the only ultra low-power NVIDIA GeForce® GPU and the first 1080p HD mobile video processor. Taking full advantage of the two speedy 1 GHz processors sharing the workload in Tegra 2, consumers can experience up to 2x faster web browsing and up to 5x faster gaming performance over single core processors running at 1 GHz. NVIDIA’s leadership in graphics also delivers flawless 1080p HD video playback, console-quality gaming and amazing 3D capabilities. LG’s Optimus Series smartphones featuring the NVIDIA Tegra 2 mobile processor will debut starting in the fourth quarter of the year. To play 1080p content without having to spend time converting it to a lower resolution. And Samsung expects us to get legal 1080p content where? Will it play mkv files with DTS as the only audio track? Doubt it. most people have to fiddle with conversions anyway, as it appears to support only level 3.1 baseline profile.